When Bob Palmer’s father purchased acreage just outside of Salem, OR in the early 1960s, the property was approved for houses. The elder Palmer developed several acres, then in 1972, land use laws tightened up and the property was rezoned for exclusive farm use. Palmer says that on one leased property, Turkish firs ranging from 2 to 14 feet tall were growing wild without any management. After Palmer started culturing those trees, they began to change in appearance. 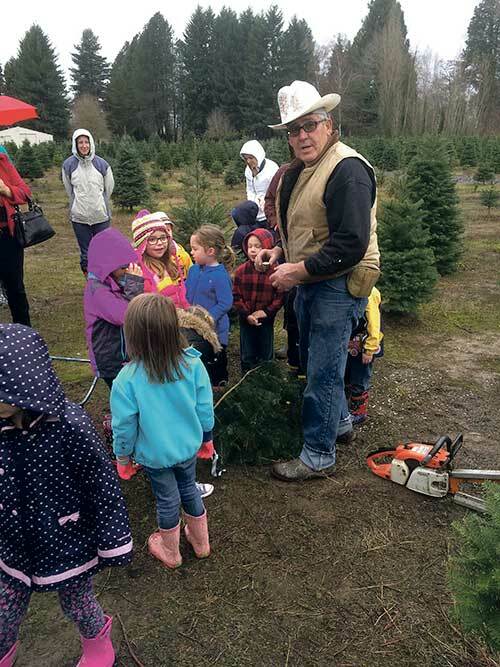 “Some were pretty open the first year, but after a couple years of filling in, they were semi-natural looking,” he said, adding that open trees with more space between branches are becoming more popular. “I tell people those trees keep a long time, and they come back the next year and want another.” Palmer says that Turkish firs do well in an interplanting system and are relatively bullet proof when it comes to resisting insects and disease. Palmer admits he didn’t have a good initial master plan for handling parking for the number of customers. He has widened the gravel lane leading to the farm and uses that for parking. “We try to move the process along without rushing people,” he said. “We bale most of the trees and get people out quickly once they decide on a purchase. That opens more parking for others.” Palmer is thankful for cooperative neighbors who tolerate traffic congestion during the season. In the field, customers have a clean walking surface that Palmer works hard to maintain. “I try to keep a grass cover that’s relatively weed-free to avoid mud during the choose-and-cut season,” he said. In addition to trees, customers can purchase wreaths, garlands and candy cane swags. Palmer says that they tried making these items on site, but found that it was too labor intensive and easier to purchase such items wholesale. Visit Palmer’s Christmas Trees online at www.palmerschristmastrees.com .